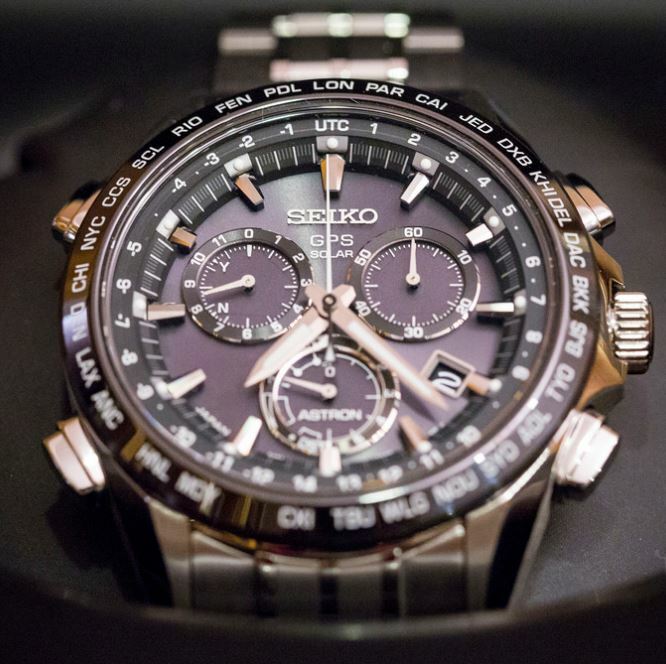 The Seiko aviator impresses with its high-quality construction and amount of functions. 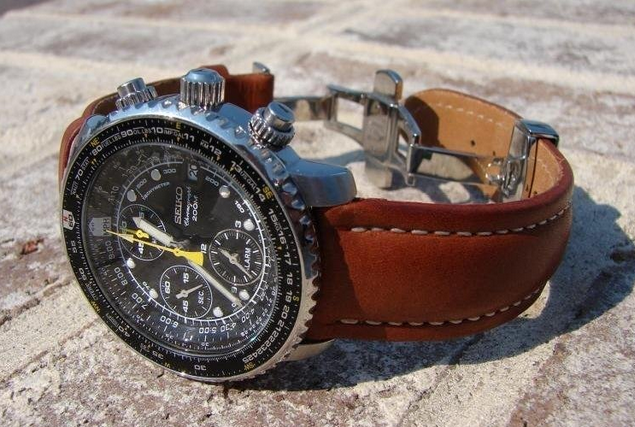 A must have for true aviators which only seek for the best. 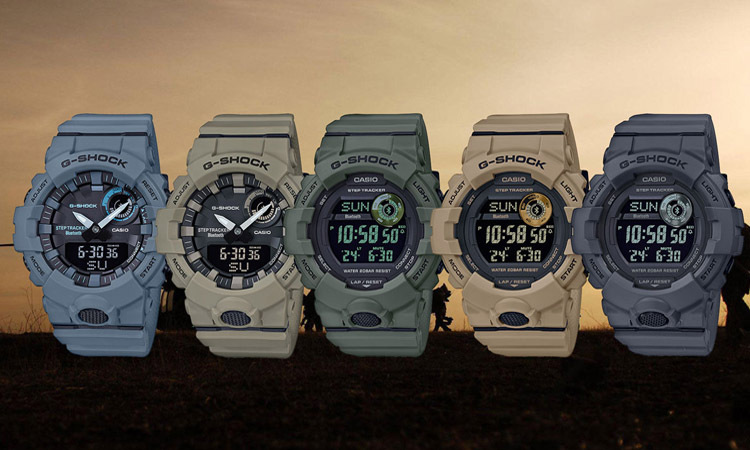 Highly resistant to all sorts of shocks and scratches. 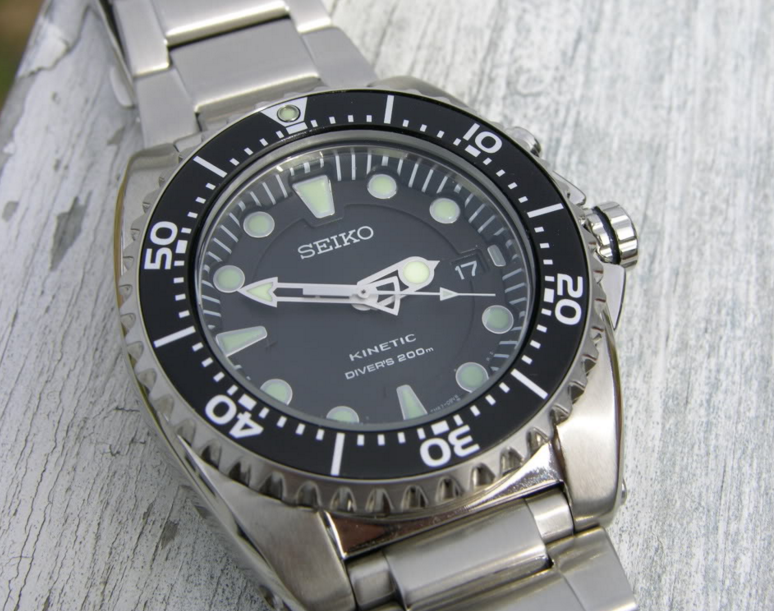 Before you start here are other Seiko watches that we reviewed: SEIKO SKX173 Dive Watch, SEIKO SKA371 Stainless Steel Kinetic Dive Watch and the SEIKO SSC017 PROSPEX. 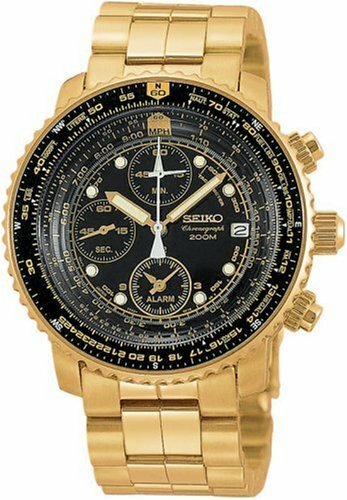 Pilots and fans of features-packed watches with several calculation capabilities likewise will undoubtedly love the Seiko Men’s SNA411 Flight Alarm Watch. 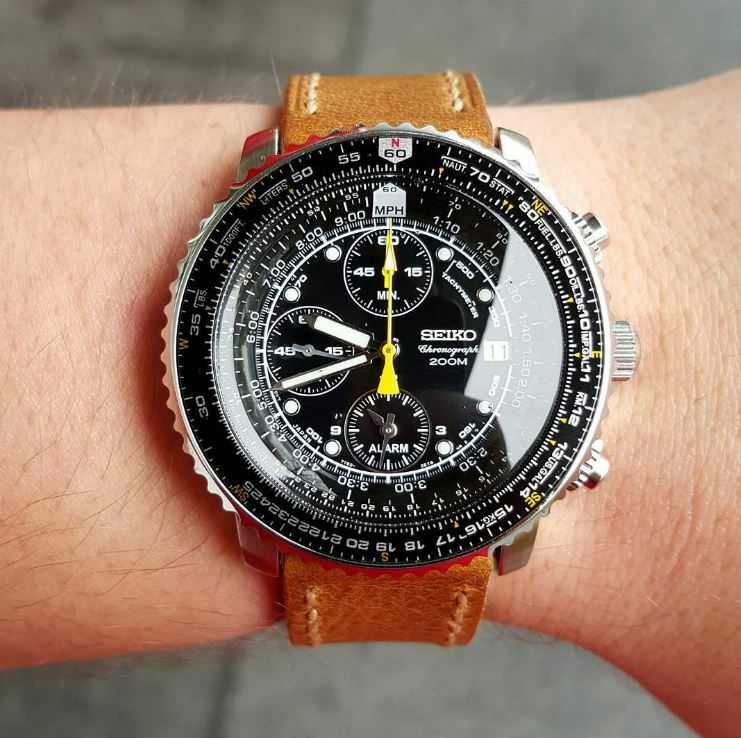 It comes with a bold design and tough build made to withstand bad treatments and be a reliable companion for years; that being the reason why the Seiko SNA411 actually resembles with the Breitling Navitimer. 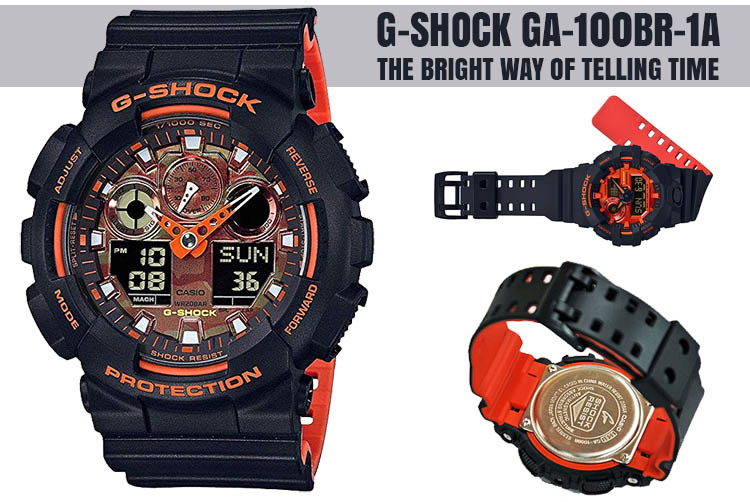 This is the kind of watch that will make you noticed and receive lots of compliments over time, take my word for it. I always said this throughout my other reviews as a rule of thumb which can apply in virtually every domain: You get what you pay for. In most situations the more a product costs, the more it pays for itself over time or holds value for reselling, and the opposite happens for cheaper items. 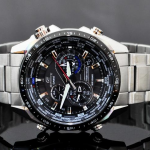 Now based on your budget you can go for the absolute best watch brands like Rolex, Breitling etc. 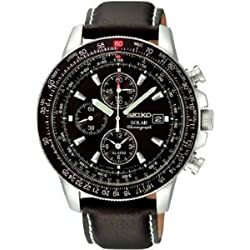 or you can go for a compromise between price and quality (see how I do not consider cheap watches as an option in any way). 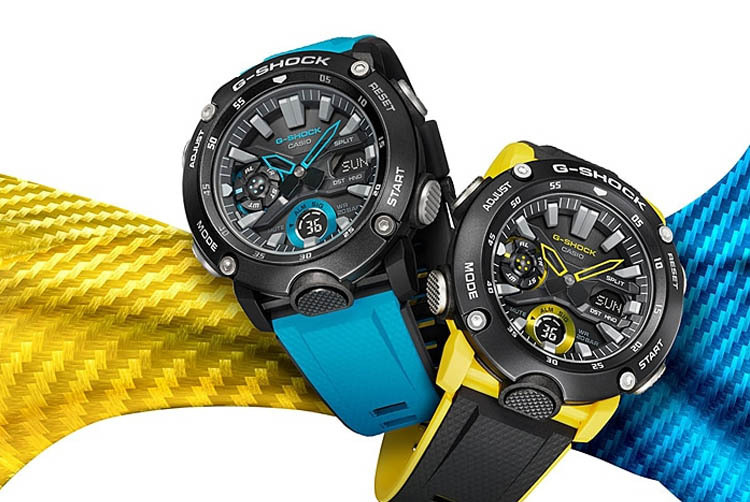 And there are a lot of watches that stand somewhere between these two extremes which offer good enough quality at a reasonable price. 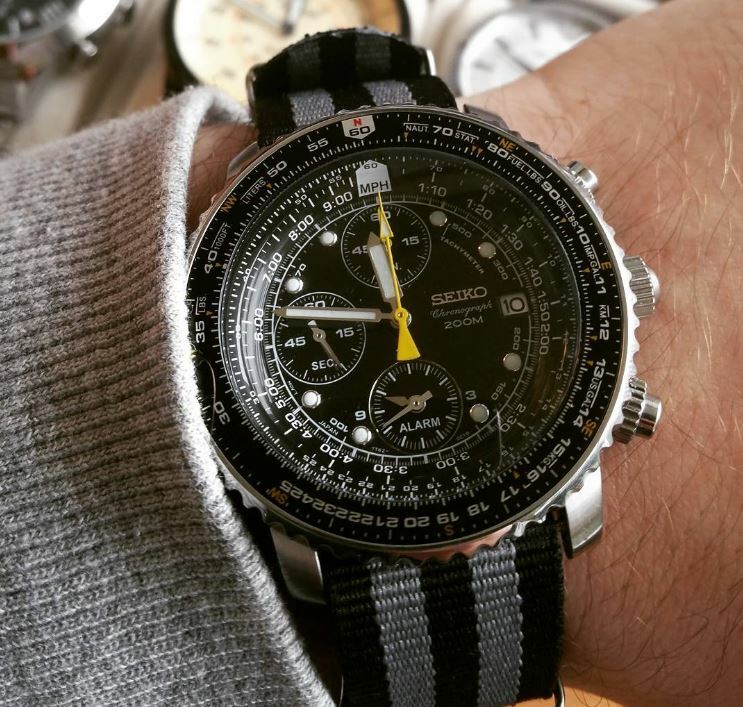 This is exactly the case of Seiko as a brand and of the SNA411 Seiko Aviator in particular. 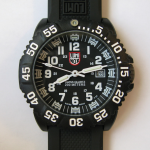 Coming at a case diameter of 42 mm it is neither too small nor too big; I would say this is the best size to express enough masculinity but still maintain a sleek appearance. 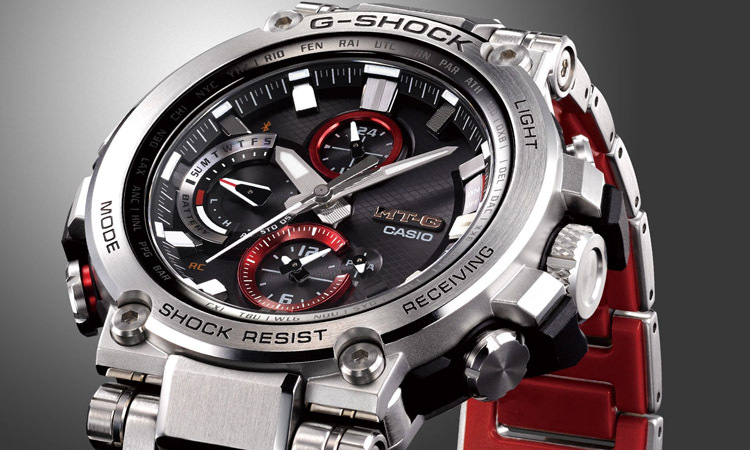 Speaking of other design elements, the bracelet is made of the same high-quality stainless steel as the case and features a push-over button closing system with a safety closure mechanism which makes it secure enough that it won’t fall off the wrist when you don’t want it to, but still remain easy to operate. 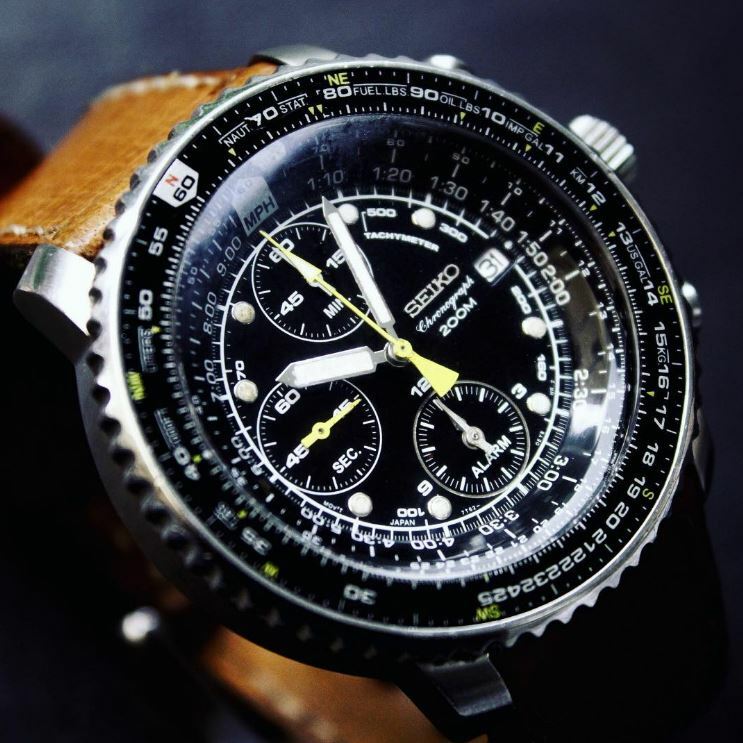 Some people say that the dial is kind of “overcrowded” with too many technical inscriptions, but I would say that it is both a design and functionality element that truly gives the watch its own personality and actually makes it more pleasing and desirable. 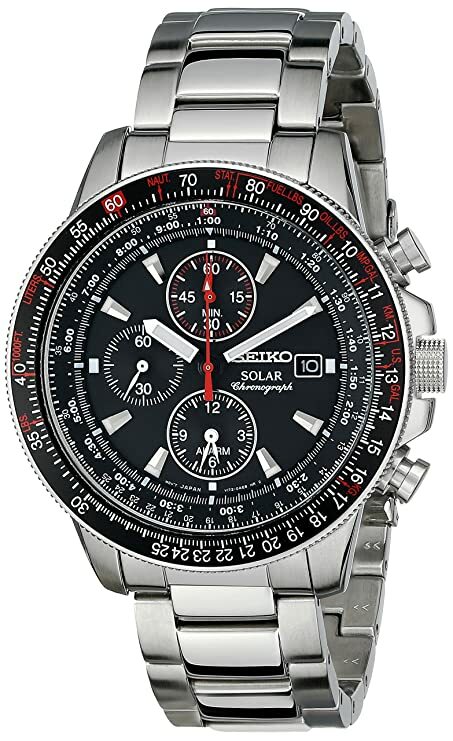 Since this watch is intended for heavy use, the dial window is made of a scratch and shock resistant Hardlex crystal which also protects the other two sub dials and does a great job in magnifying the fine inscriptions from all over the sides and the background including the index hands. 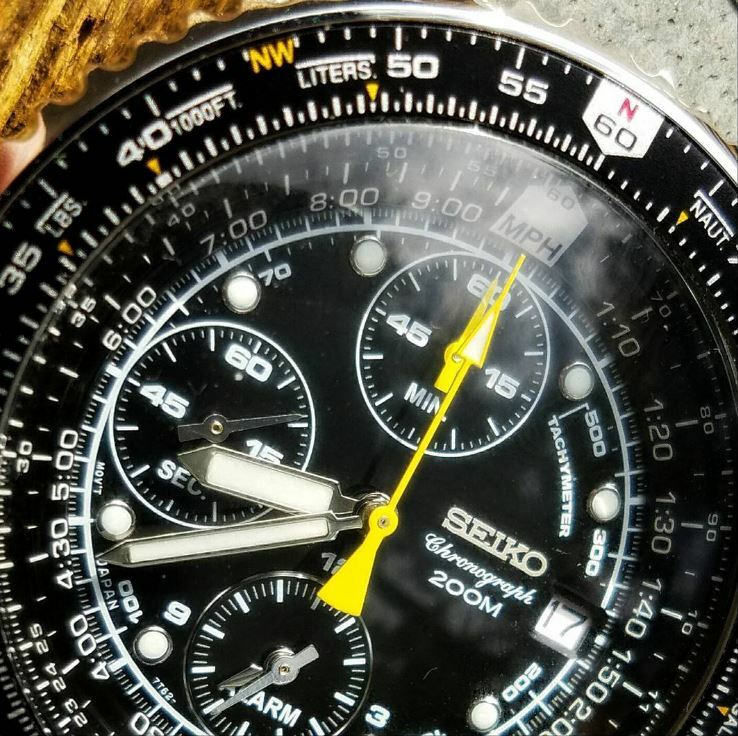 Definitely, the looks of the Seiko were carefully crafted in order to satisfy the fashion-conscious pilots who do not accept compromises on design nor functionality. 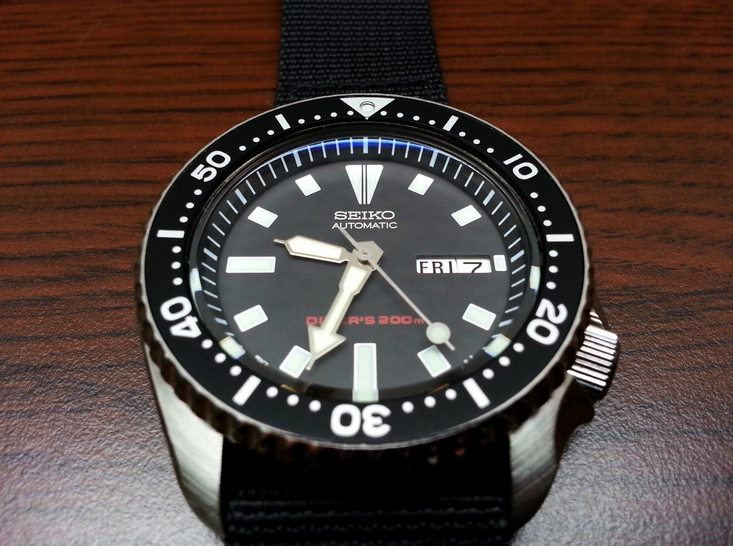 Now that we figured out the design, let’s get to more technical characteristics of the Seiko SNA411. 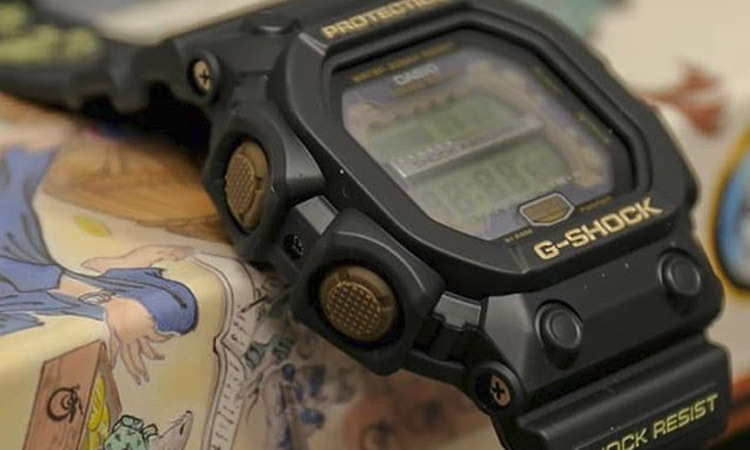 The 660 ft. water resistance will give you a lot of freedom regarding any activity that implies big depths of water whatsoever. 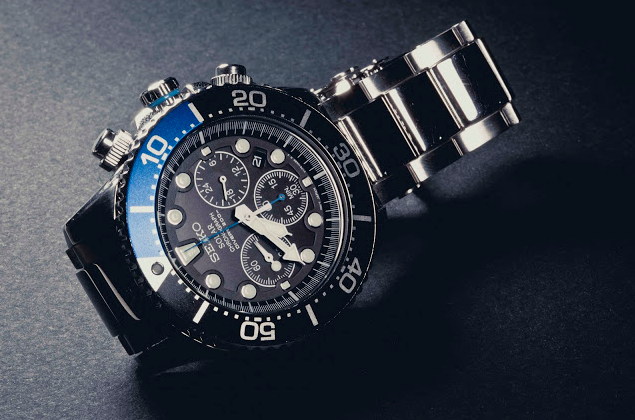 If you plan on diving without a wetsuit or other kind of other special diving devices, you won’t have to worry about the resistance of the watch. Things get tricky only when professional diving comes in, and greater depths are involved. 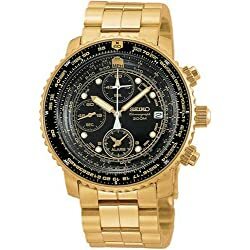 Now since you probably wonder from the first time you have seen this watch, what the small writings on the sides represent, here’s some info on it. 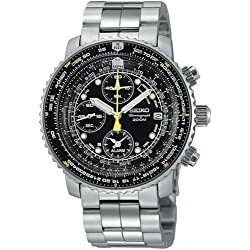 The three small circles on the background are for the compass, stopwatch, and alarm, the hands are obviously for showing the hour, and now from the edge to the center we have the rotating bezel, a utility bearing compass scale, a conversion scale, a logarithmic scale on the bezel ruler, the fixed dial ruler, a logarithmic scale on the dial ruler, a time index for time conversion and finally the time scale. With these features, you can make from calculations of the remaining fuel in the gas tank to any sort of complex calculations needed as an aviator. I would love to explain every feature in particular; however, I do not have enough space and time to do so. 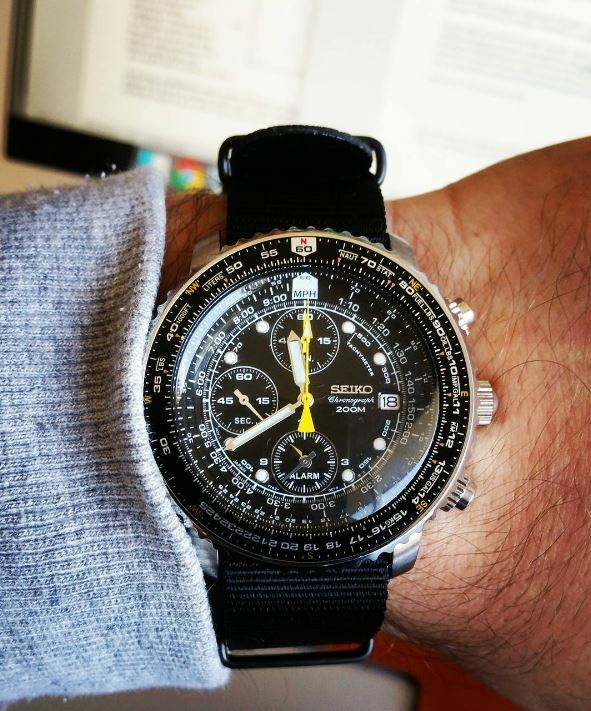 That being said, I highly recommend you to explore Seiko’s Rotary Slide Rule Manual which tells about everything on how to make calculations and interpret these awesome features. 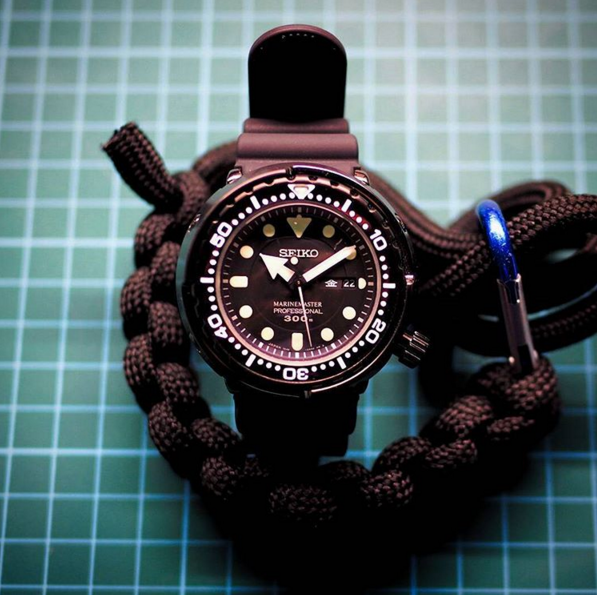 Another feature that is worth talking about is the luminescent index hands and indicators for every hour which are good enough for most dark situations, although it does not make it suitable for deep underwater readings like dedicated dive watches. 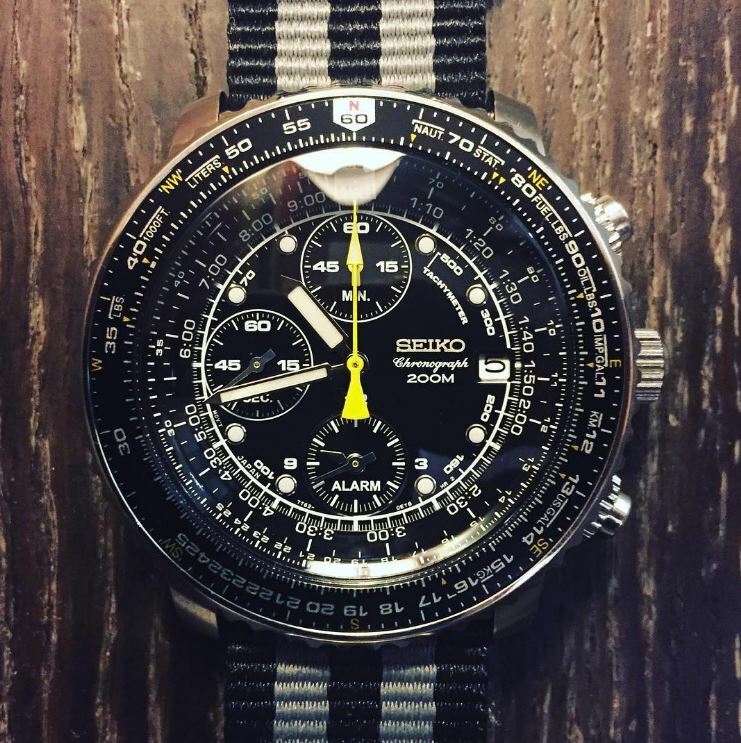 Also, it has a very nice date window positioned at the 3 o’clock position and an outer ring which rotates in response to a twist on the knurled ring and aligns with an inner ring to deliver data and tachymeter functionality. 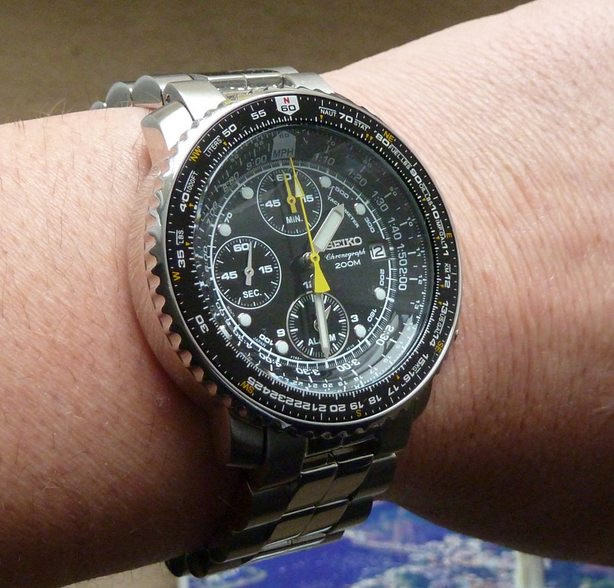 I got to say this; the Seiko SNA411 is not for everyone. 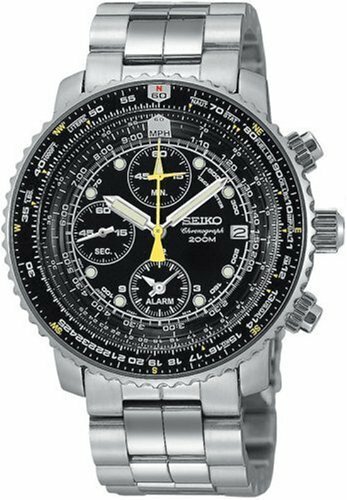 It is a timepiece which proves the already great status of Seiko and comes with outstanding features for an aviator’s watch. 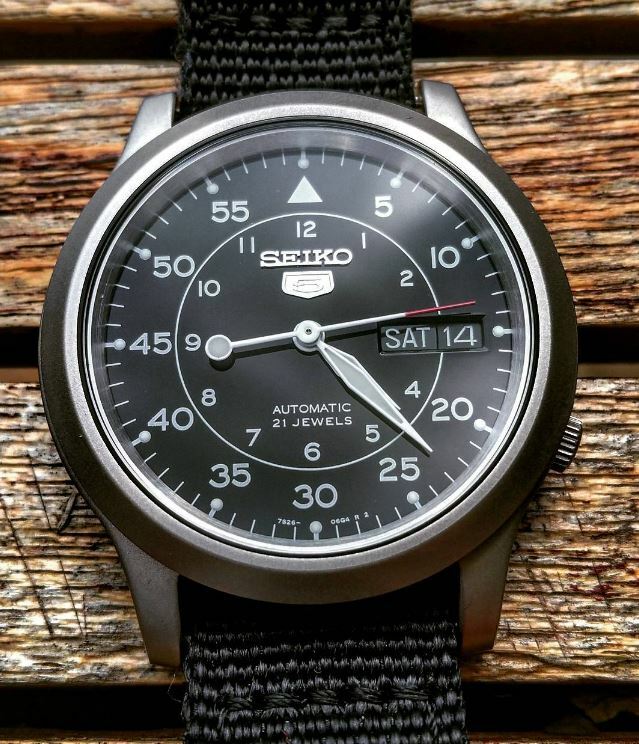 If you want a great, yet affordable watch that includes all of these features and comes with a sleek design then the Seiko SNA411 might just be for you. 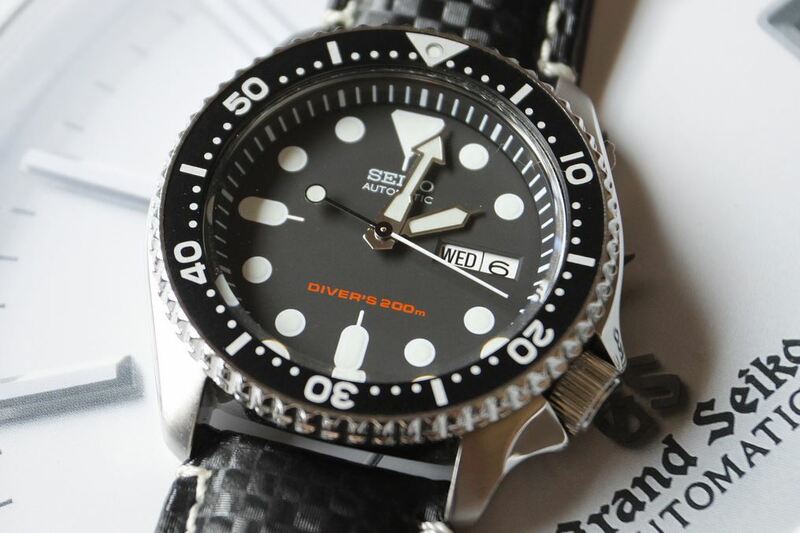 You might want to take a look at our selection of best Seiko dive watches by clicking here.